Ever think how directors choose people for animated films? 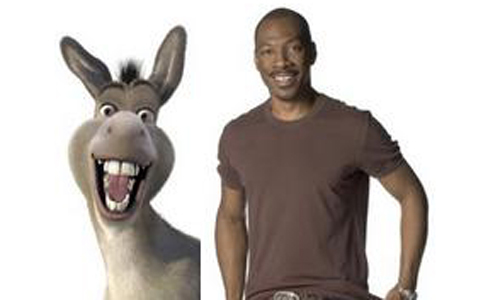 How Eddie Murphy was the perfect donkey in Shrek, or John Travolta as Bolt in the movie. Lots of thinking goes into the planning of actors/actresses into characters. We think about how their character relates to the character, the kind of voice, and people who have the capability to become the character. Actors/actresses are then brought in to record, and in recordings, they record alone to avoid imitation. An interesting concept taken from this is people think people like John Travolta look like Bolt from the movie, but the appearance and wardrobe were designed and decided before the voice. The animators do not see a correlation between Travolta’s looks and Bolt’s, but the audience who saw the voice and appearance together saw the relationship. Great post! I missed Bolt so I can't comment on that, but Eddie Murphy really was a perfect Donkey in Shrek. It's interesting to see how they connect, especially when you hear a voice actor in multiple roles (like Bob from Bob's Burgers also voices Archer). It's strange how our brains connect the two together! First of all I love the movie Shrek. I never thought of how you automatically connect faces to voices. Usually they are fitting with each other. When you can hear a voice and can automatically connect it to a face is interesting to think about. I agree, when I first saw Shrek I automatically knew who played what role. I never really stopped to realize it but I do that with many cartoon movies. I try to fit the cartoon with the actual actor or actress. For example, when I first saw Finding Nemo, I instantly knew I recognized Dory's voice and then went on to find out it was Ellen. This is so fascinating! I have always thought that the look of some animated characters were influenced by the actor/actress voicing them. I wonder why the audience can see the similarities between the character and voice actor, but the animators do not. This has peaked my curiosity, so I am going to research more about this!